Students - We all have favorite habits that become regular parts of our lives, small rituals and routines that tie one day to the next, that make us who we are. 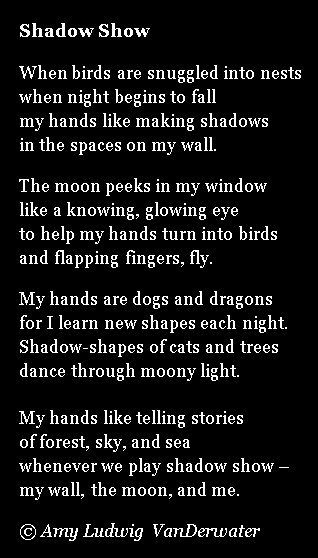 Today's poem is about something that many children (and adults) like to do - make hand shadows! Making hand shadows feels like a game between person, light, and wall, and today's poem celebrates this simple way to enjoy dusk or night. This verse is made up of four quatrains (four line stanzas) with the second and fourth lines of each stanza rhyming. Do you notice the repetition of the words my hands throughout? I am hoping that this repetition makes it feel like the hands are dancing through the different lines, shaping words in the poem just like hands will shape pictures on a wall. What are the simple joys that add happiness to your life? The rituals that you carry from day to day? These small habits will feed you well as a writer. Well, happy last Poetry Friday of March 2015. Weather-wise here in Western New York, March has come in like a lion...and it is going out like a poem! Here's some news. I am happy to share that on Monday evening, March 30, I will kick off Poetry Month by hosting a WonderChat for Wonderopolis on the topic of "Celebrating Wonder and Poetry." The time for this is 8pm EST, and you can see the button for it up in the left hand corner of this page. Next Friday, the first Poetry Friday of Poetry Month, I'll be hosting Poetry Friday here at The Poem Farm. Many Poetry Friday friends are planning poetry projects, and I can't wait to visit them throughout next month. I'll have a special month-long poetry project running here too, and I will announce this on April 1. My host-post will go live at on Poetry Friday midnight for all poetry owls. Next Sunday evening, April 5, also at 8pm EST (date may change - this is Easter), I will be happily co-hosting the Teach and Celebrate Writing Twitter Chat with Ruth Ayres and Christy Rush-Levine...also about poetry...hooray! Jone is hosting today's Poetry Friday roundup over at Check it Out. Swing on over to her place to meet new friends, find old ones, and bask in the joys of song and silence. You are on a SERIOUS roll with all the goings on in your poetic life. It motivates me, and keeps me chugging along. Bravo! Love the poem, by the way. That is a collection or anthology worthy poem for sure. Wonderful poem, and I can see it all in my inner eye. I like how you read it, too, slowing at the end, sorry the show is over for now. :-) I remember playing with shadows when I was a little girl, too. 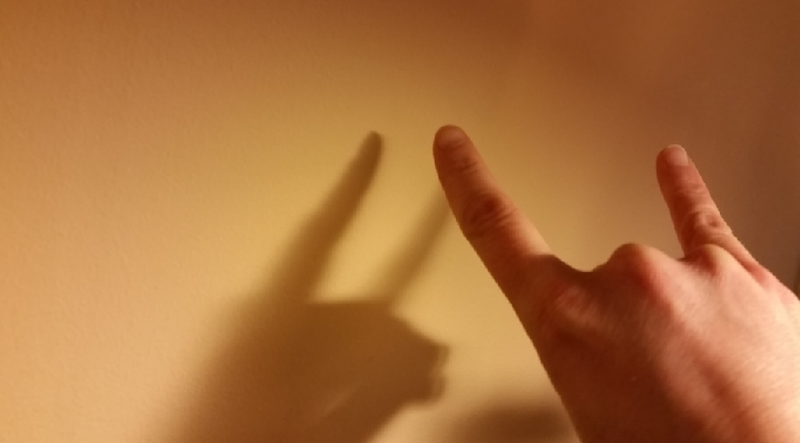 I used to love making shadow shapes and your poem captures all the fun having a "shadow show." Looking forward to hearing more about your April poetry project and your Twitter chat on Monday! Exciting to hear about the coming chat with you, Ruth and Christy, Amy. I love the poem, that last part about playing with the moon, the wall, and me-beautiful. Perfectly lovely poem. Thanks for sharing it here. The joy of simple pleasures! I love the way you set the stage for this one. Love both the poem and the photo! Speaking of poetry chats on Twitter, Janet Wong and I will be co-hosting the #nctelem chat on 4/19...topic is...POETRY! So excited to have found this site. Thanks for such a wonderful resource and place of inspiration!